This Thanksgiving take the time to pray. Pray with a grateful heart. Pray to offer praise to God for life and for loved ones. Pray for God to lead you in the path of God’s choosing. People have been so deeply affected this year by disasters and violence in our world. Pray for healing and work that must be done to restore lives and property. Pray to help people who are hurting. Pray so that the prayers are not words only, but turned into action. God provides us with true blessings in abundance. We have joy and laughter; we have courage in the face of fear, hope where there is doubt, comfort when we have tears and sadness. God is with us in all things. John Wesley believed in the love and blessings of God. Even on his death bed, he said, “Best of all, God is with us. Pray for our community as we seek to strengthen and grow in Christ. Pray for the staff and leaders who work to make ministry meaningful. Pray for all the people who serve and provide the financial resources for ministry to take place. Pray for our church as we continue to make disciples of Jesus Christ for the transformation of the world. 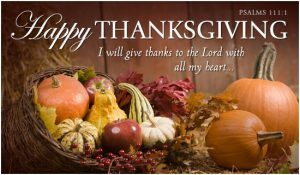 Thanksgiving is inseparable from true prayer. Give thanks to the Lord always with a grateful heart. I am thankful for you and our church. I am thankful for all that God is doing among us as we pray for the power of the Holy Spirit to lead us into the future.